Calderas and caves | Twende pamoja! 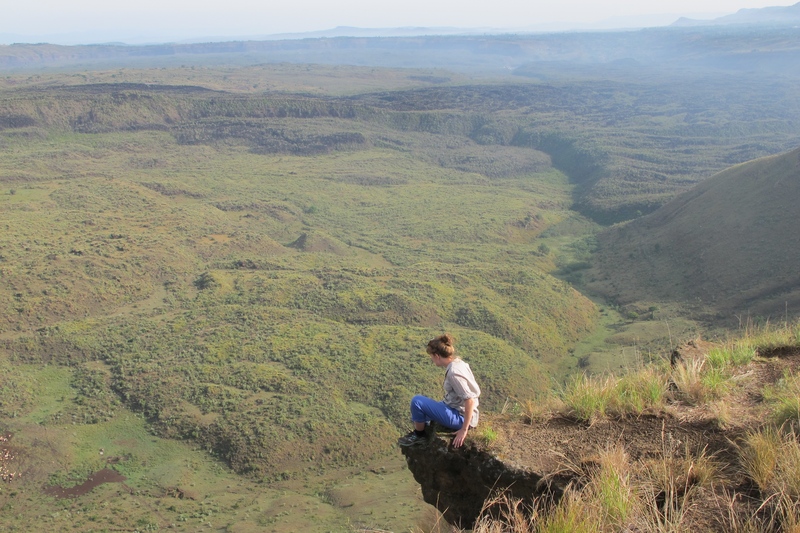 This weekend a few of us took advantage of a VSO workshop held outside of Nairobi and went on a hike to the Menengai Caldera – the world’s second largest caldera (sort of like a crater but caused by a volcano collapsing on itself rather than the top blowing off!). It was quite a sight to be seen. But I have to admit it was the Mau-Mau caves nearby that held my attention more. These days the caves have an altogether different use, as a place of worship for Christians coming on retreat to pray and fast for days and weeks at at time. 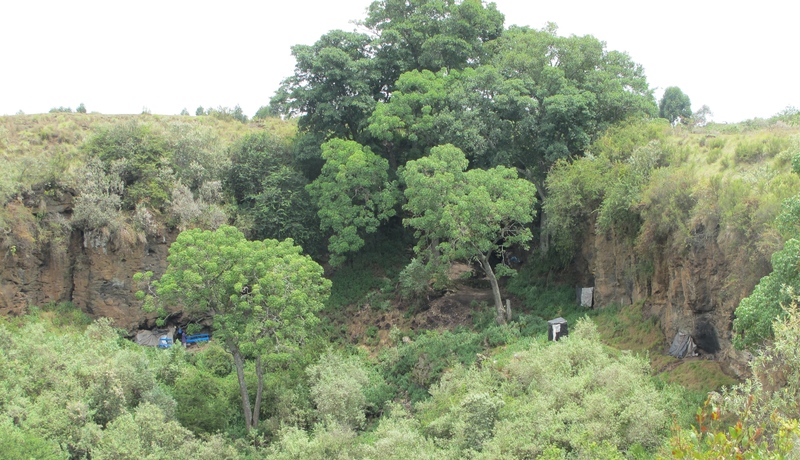 This was our first glimpse of the caves, hopefully you can just make out the temporary little shelters. The huge tree you can see is a fig tree. Fig trees have huge resonance for many of the ethnic groups in Kenya but in particular Kikuyo’s and often mark a meeting place. After descending a treacherous ladder made out of the roots of the fig tree and any old bit of wood that was lying around, or so it seemed, we came to the actual entrance of the cave. By this point I really felt weird. As we walked into the pitch blackness of the cave we could hear the angry shouting of a man somewhere in the depths. Slowly it became clear he was praying furiously. Taking care to avoid tripping over the buckets that collected the water dripping off the walls of the cave for drinking water, we walked in deeper but never saw the man who the voice belonged to. However we did stumble across other people sitting praying in silence in the dark. I have no idea how many people were in there in total! Now, I’ve been to a fair number of religious sites both at home in the UK and overseas. But I’ve never been to a place like this. And I have to admit I didn’t feel comfortable. There was something about the hostility and harshness of the location that didn’t inspire the awe and wonder or peace and serenity that I have felt at other times despite not being religious. It felt isolating and lacking in humanity. The aggressive slogans written on the cliffs in white paint instructed you to fear the power of God and I found it alienating. There was not one part of me that could relate to the motives that would bring people here. So it was with a strong sense of relief that we clambered back up the fig tree ladder and into the fresh air where the sun was shining. I took a video, so despite the pitch black you might get a sense of the environment.